Tools & Home Improvement. Patio, Lawn & Garden. Beauty & Personal Care. Pro Audio & Sound. Car Audio & Electronics. 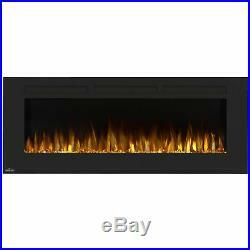 Napoleon Allure 60 1500W 5000 BTU Wall Hanging Ultra Slim Electric Fireplace. Can heat up a room up to 400 square feet. Features front vents within the sleek design. Can be fully recessed into the wall for a flush appearance or easily hang on the wall with a built-in bracket. Ultra slim design with 5-inch depth makes it one of the slimmest wall mounts in the industry. Grab your favorite book, a cup of joe, and warm your bones with this Napoleon Allure 60-Inch 5000 BTU Wall Hanging Electric Fireplace. 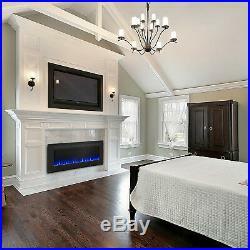 Heaters gonna heat, and this one heats a room up to 400 square feet in size. The Allure features a boujee, sleek design with front vents, a 5-inch depth, and high intensity LED lights. 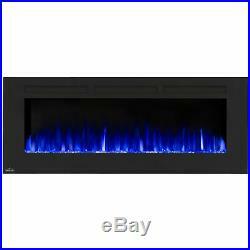 Simply hang it on your wall, plug it in, and you’ll experience a delightful ambience of orange flames, blue flames, or a beautiful combination of the colors that will really have you intrigued. The glittering glass ember bed will swoon you over as you’re cuddled up on the couch. With a remote included, the Napoleon Allure Electric Fireplace gives you the warmth, vibe, and comfort you’ve been dreaming of. Crystal clear cube ember bed accents the flame. Feature the option of both blue or orange flame, or a combination of both. Convenient remote control (controls flame intensity, flame color option, blower, heat output and timer). High intensity LED lights provide day or night intensity and require no servicing. Easy access manual on/off switch. Easy installation with a built-in mounting bracket. On screen controls dim after 10 seconds disappearing completely off screen. Simply plugs into a 120V wall outlet or can be hard wired. Up to 5,000 BTUs. Dimensions (H x W x D): 21.125 x 60 x 5 inches. Napoleon is proud to be committed to your total home comfort. Time after time, Napoleon has led the way with new and innovative, patented technology. We are proud to say that our products continuously surpass industry standards and our inspiration is you! More than anything we want you to feel confident in choosing Napoleon for your home. Our products are designed to provide that confidence and ensure that every Napoleon Product is beyond compare. It all began in 1976 when a small steel fabrication business launched by Wolfgang Schroeter started manufacturing steel railings in Barrie, Ontario, Canada. At that time, no one could imagine the incredible future that lay ahead for Wolf Steel Ltd. Cancelling Your Order: Your order is important to us and will be processed immediately. Select the reason for the return. View more great items. This listing is currently undergoing maintenance, we apologise for any inconvenience caused. The item “Napoleon Allure 60 1500W 5000 BTU Wall Hanging Ultra Slim Electric Fireplace” is in sale since Friday, July 13, 2018. This item is in the category “Home & Garden\Home Improvement\Heating, Cooling & Air\Fireplaces & Stoves\Fireplaces”. The seller is “vm-express” and is located in Lincoln, Nebraska. This item can be shipped to United States.